With the upcoming Terminator 2 3D re-release hitting theaters next weekend, Robert Patrick has been making the press rounds, where he dropped quite the bombshell. The actor, who essentially launched his career by playing the nefarious T-1000 robot in T2, revealed that rock star Billy Idol was cast in the role before him, but was forced to drop out, leading the way for his breakthrough role. Here's what Robert Patrick had to say about Billy Idol's casting. "Billy Idol was set to do the role of the T-1000, as I understand. I can tell you that I saw Billy's image when I went to Stan Winston after I got the role. Unfortunately, he got into a motorcycle accident and busted up his leg, so he wasn't able to physically do what the role demanded." 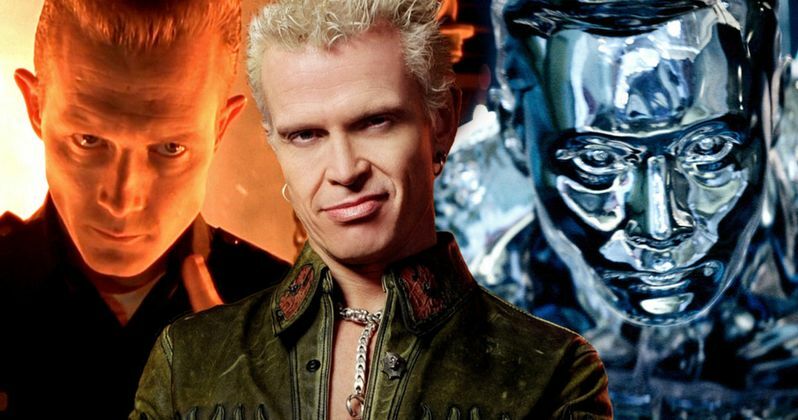 Oddly enough, Billy Idol would go on to make his feature film debut in The Doors, which opened a few months before Terminator 2 in 1991, and he would then go on to have roles in Mad Dog Time and The Wedding Singer, as himself, while voicing Odin in Heavy Metal 2000. Robert Patrick revealed this surprising detail during an interview with The Hollywood Reporter, where he also spoke about how his agent tried to "sell" the actor to casting director Mali Finn. Here's what he had to say below. "My agent sold me to the T2 casting director (Mali Finn) as a cross between David Bowie and James Dean. So, I was trying to create an intense presence while I was sitting with Mali. I had this intense stare, which she liked. It was just one of those moments when everything came together at the right time." After working on some movements he would only describe as "insect-like," Robert Patrick received a call from director James Cameron to do a screen test, and then he landed the role. Before winning the T-1000 role, Robert Patrick only had small roles in films like Future Hunters, Eye of the Eagle, Warlords From Hell, Equalizer 2000, Behind Enemy Lines and Die Hard 2. Once he landed the role, he set off to train in quite the unique way, learning how to run at full force, but then stop without showing any physical signs of fatigue. Here's what the actor had to say about his training below. "I trained four times a day and physically got myself into it. I did it like a sprinter would: I locked eyes on a target and focused so there was no wasted energy. When done, I would clench my jaw, no mouth breathing, only through the nose and no expression because the character would not be straining." The training certainly paid off, although it might have been almost too effective. One of the first major scenes for the T-100 was at the mall, where he chases down John Connor (Edward Furlong). The actor revealed that he was running so fast that he even ruined a take by actually catching up to Edward Furlong on his dirt bike. Here's what the actor had to say about that scene below. "The first big chase sequence we did at the mall before I take the semi, I caught John! And I was like, 'What the f#c! do I do know?' And Jim was like, 'Jesus Christ! How fast can you run?!' And I said I didn't know. So they had to crank up the speed of John's dirt bike." Robert Patrick also spoke about a scene that was ultimately cut from the theatrical version, but remains on the DVD, where the T-1000 has to kill John Connor's dog. Since the actor is a big animal lover, that scene was difficult to shoot, but he added that it made total sense because his character is, "a predator relentlessly tracking someone down and this thing was in the way." Along with his physical training, Robert Patrick also had to master firing and reloading the Beretta 92FS gun for a scene where he empties an entire 16-bullet clip into the T-800 character played by Arnold Schwarzenegger. He then had to reload while never taking his eyes off the target. Here's what Robert Patrick had to say about his weapons training with weapons master Harry Lu. "I worked with (weapons master) Harry Lu a lot. Jim told me I had to be extremely proficient. I had to work on squeezing the trigger as fast as I could, locking eyes on Arnold down the hall, and dropping the magazine without looking and being able to grab a new magazine and reload instantly, also without looking. I had to practice and practice and practice until I got it. And the thing that I added, and I was proud of, is I did it without blinking." Robert Patrick also added that he got to see the 3D version of Terminator 2: Judgment Day in James Cameron's screening room, adding that he got "immersed in the movie" since he has only seen it a few times, adding that the 3D conversion was a rare example of "taking an almost perfect film and making it even better." It remains to be seen if fans will think the same way when this 3D re-release hits theaters starting August 25.